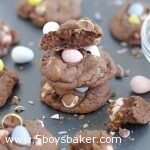 These Chocolate Cadbury Egg Cookies are quite evil and addicting. 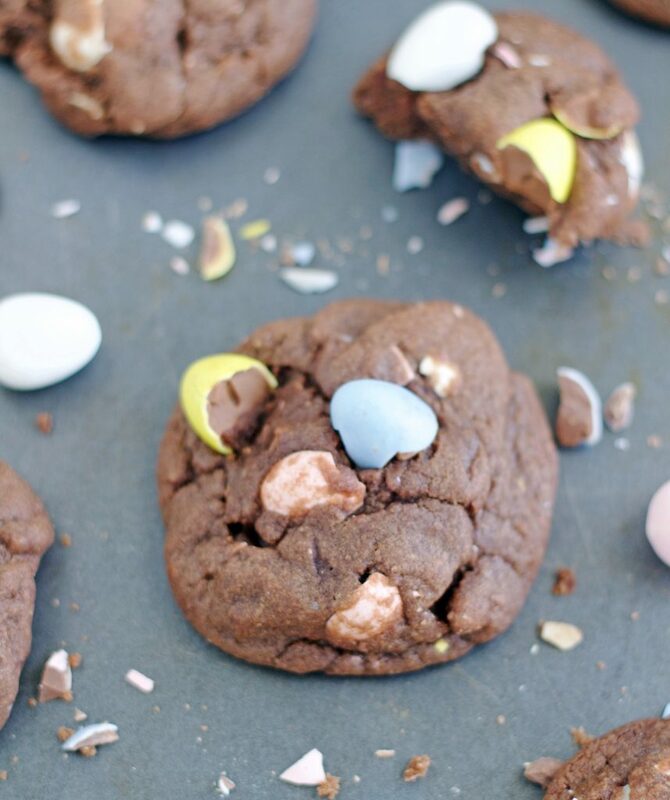 A thick, soft, chocolaty cookie filled with Cadbury Mini Eggs. Good luck eating just one. Cadbury Mini Eggs are my downfall (ok, they’re one of my many downfalls). Why are they so darn addicting? They’re evil little things really. I might just give up my first born for a bag of them. Ok, not really, but really ( LOL). I hoard them after Easter. At the risk of embarrassing myself I’ll share a little story. A couple years ago I was at Walmart the day after Easter and a lady had a cart full of them. She told me that she’d read online that they wouldn’t be available in the United States the next year. So, I believed her because after all, isn’t everything you read online true? I bought about 20 bags (ok, maybe it was even more). Well guess what? The next year the store shelves were stocked with Cadbury Mini Eggs. But hey, one can never be too prepared. Funny though, we certainly didn’t have a problem consuming my surplus bags of them. 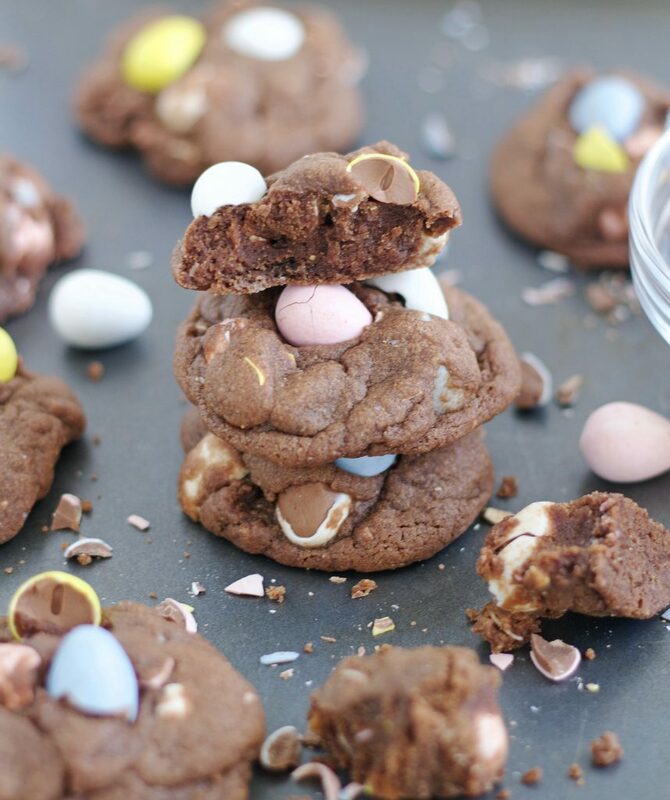 These chocolate chocolate chip cookies are one of my favorite cookies so I decided to swap out the chocolate chips with Cadbury Mini Eggs. Best decision ever. I ended up delivering some to a couple of my friends because I had to get them out of my house. My friend texted me and told me they were the best cookies she has ever eaten. I told her they probably weren’t really, but thanks. Her reply was “no really, they are”! They’re soft and kind of just melt-in-your-mouth. Make sure you follow the directions carefully for these cookies because it makes a huge difference in how they turn out. 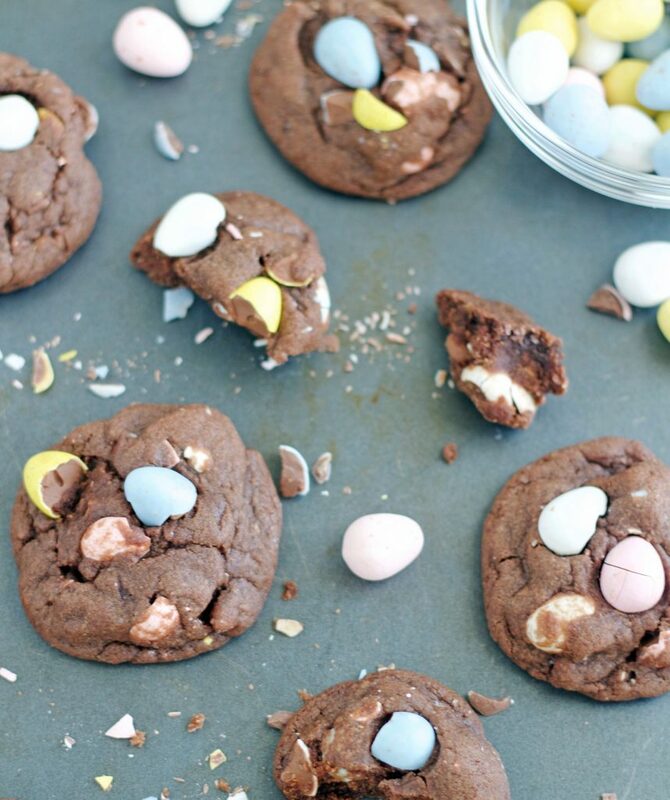 Now go make these cookies and if you don’t have a bag of Cadbury Mini Eggs, I may just have a bag or two lying around I could share. Add flour, salt, baking soda and cocoa. Mix until all blended together. Add the Cadbury mini eggs. and turn your mixer on medium for just a few seconds to stir them in. This also helps break some of them up if they're still whole (the dough will be stiff). Roll dough balls by hand, making them slightly larger than normal (about the size of a golf ball). With the palm of your hand, gently pat them down just slightly after placing them on an ungreased cookie sheet. Bake for about 8-9 minutes, DO NOT OVER BAKE!! Remove from cookie sheets and cool on a cooling rack. You really need to make these in an electric mixer, a hand mixer just doesn't work well with this recipe. Because you're not creaming the butter and sugars, the dough is really thick and it is hard to incorporate the dry ingredients well enough with just a hand mixer. Don't soften your butter before hand, you want it to be cold. Use it straight from the fridge. Don't even think about "creaming" the butter and the sugars together, just mix them for about 30 seconds or so. There will still be pebble-sized lumps of butter, but don't worry because they will be gone by the time you mix in all the other ingredients. Do not overbake! These cookies will still look slightly underbaked. While you have a batch baking, keep the remaining cookie dough in the fridge until you're ready to bake the next batch. I like to just take my rolling pin and give the bag of Cadbury eggs a couple whacks before I open it. This is much easier than trying to chop them. I am a 73 year old grandmother who loves your blog and baking. Your Lemonhead cookie recipe has been our favorite untillll this Chocolate Canbury Cookie. It is to die for. 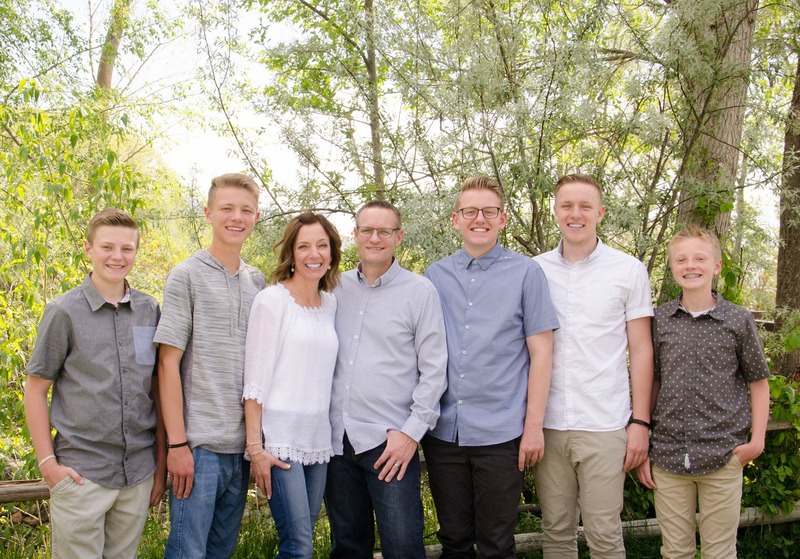 My 14 year old hockey player grandson wanted to know if I could make them “hockey puck size!” Keep the great recipes coming. Hi Sharie! Thank you so much for your sweet comment, you honestly just made my day. I have to agree those Lemonhead cookies are sooo good, but these Cadbury ones are pretty amazing too!! So happy you loved them. Thanks for taking the time to leave a comment, I really appreciate it. So you bake with convection? Hi Anna! I bake with both regular and convection. The majority of my cookies of bake at 325 on convection, but there are sometimes I use the regular setting and bake at 350. I’ve done it both ways with these cookies and they are perfect either way.